Injury is the leading cause of death and disability in children. Each year, almost one in six children in the United States require emergency department (ED) care for the treatment of injuries, and more than 10,000 children die from injuries. Severely injured children need to be transported to a facility that is staffed 24/7 by personnel experienced in the management of children, and that has all the appropriate equipment to diagnose and manage injuries in children. Anatomical, physiological, and emotional differences between adults and children mean that children are not just scaled-down adults. Facilities receiving injured children need to be child and family friendly, in order to minimize the psychological impact of injury on the child and their family/carers. Early recognition and treatment of life-threatening airway obstruction, inadequate breathing, and intra-abdominal and intra-cranial hemorrhage significantly increases survival rate after major trauma. The initial assessment and management of the injured child follows the same ATLS; sequence as adults: primary survey and resuscitation, followed by secondary survey. A well-organized trauma team has a leader who designates roles to team members and facilitates clear, unambiguous communication between team members. The team leader stands where he/she can observe the entire team and monitor the "bigger picture." Working together as a cohesive team, the members perform the primary survey in just a few minutes. Life-threatening conditions are dealt with as soon as they are identified. Necessary imaging studies are obtained early. Constant reassessment ensures that any deterioration in the child's condition is picked up immediately. The secondary survey identifies other injuries, such as intra-abdominal injuries and long-bone fractures, which can result in significant hemorrhage. The relief of pain is an important part of the treatment of an injured child. Anatomical, physiological, and psychological differences between children and adults have important implications for the initial assessment and management of pediatric trauma victims. Children have less fat, more elastic connective tissue, and a pliable skeleton protecting tightly packed abdominal and thoracic structures. The force of an impact is transmitted widely through a child's body, resulting in multisystem injuries in almost 50% of children with serious trauma. Their larger body surface area to body mass ratio predisposes them to larger heat and insensible fluid loss than adults, resulting in higher fluid and caloric requirements. A rapid and well-organized team assessment of an injured child, following ATLS® guidelines, is essential. The term golden hour, while not literally defined, refers to an early and critical period in the care of trauma victims, during which the appropriate management may significantly increase patients' survival rate. The goals of initial stabilization include providing adequate oxygen delivery and ventilation, fluid resuscitation, and prevention of secondary damage to target organs. The decision of whether the injured child will be transferred to a trauma center or to the closest available facility largely depends on geographic location and local policies. There is some controversy surrounding the optimal type of facility for the management of pediatric trauma. Osler et al. reviewed 53,113 children included in the National Pediatric Trauma Registry. They found a higher mortality in children who were treated in adult trauma centers (ATCs) than in pediatric trauma centers (PTCs). However, children admitted to ATCs were more severely injured. When this was accounted for, they did not find a difference in mortality. Potoka et al. reviewed 13,351 children included in the Pennsylvania Trauma Outcome Study. They found that overall survival was significantly better at PTCs and ATCs with added qualifications to treat children (ATC-AQs) compared with ATCs. In this study, patients treated at PTCs and ATCs had similar injury severity. Oyetunji et al. analyzed 53,702 children from the National Trauma Data Bank. They found that mortality was significantly lower in ATC-AQs versus ATCs. On a multivariate analysis, the adjusted odds ratio of mortality for all patients was 20% lower at ATC-AQs than at ATCs. The primary survey is presented in a sequential fashion, but in reality the trauma team, directed by a team leader, performs the components of the primary survey simultaneously, so that the entire process takes only a few minutes. The goal of the primary survey is to find and relieve immediate life-threatening conditions. The primary survey starts at the injury scene and aims to ensure a patent airway, adequate breathing, circulatory support, and to assess major neurologic disability. The primary survey includes frequent reassessment to confirm or exclude injuries that require immediate surgical intervention. The assessment of the airway simply involves determining the ability of air to pass unobstructed into the lungs. The airway can be obstructed anywhere between the lips and the carina, by direct trauma, edema, secretions, blood, stomach contents, or foreign bodies. If the level of consciousness (LOC) is depressed, the child may not be able to maintain a patent airway and/or be able to protect the lungs from aspiration of stomach contents, because of loss of the gag reflex. The classic sign of upper airway partial obstruction is inspiratory stridor. Respiratory effort with no air flow indicates complete airway obstruction. Evaluate breathing to determine the child's ability to ventilate and oxygenate. Critical findings include the absence of spontaneous ventilation, absent or asymmetric breath sounds suggesting pneumothorax or endotracheal tube (ETT) malposition, hyper-resonance or dullness to chest percussion suggesting tension pneumothorax or hemothorax, respectively, and gross chest wall instability or defects that compromise ventilation (e.g. flail chest or sucking chest wound). Care should be taken in the interpretation of pulse oximetry readings. A child may be in impending respiratory failure despite maintaining normal O 2 saturations (SpO 2 ), especially when supplementary O 2 is being administered. Pulse oximetry only indicates SpO 2 and not oxygen delivery. If the hemoglobin is very low, the SpO 2 may be 100%, but O 2 content in the blood and O 2 delivery may be low. If carboxyhemoglobin (from carbon monoxide poisoning) is present, the pulse oximeter will reflect a falsely high SpO 2 . Vascular access, fluid, and blood component therapy for pediatric trauma victims are discussed in a separate article in this issue of the journal. Perform a quick assessment of neurologic function at the end of the primary survey, and repeat during the secondary survey to monitor for changes in the child's neurologic status. Causes of decreased level of consciousness in injured children include traumatic brain injury (TBI), hypoxemia, and poor cerebral perfusion. The latter two can exacerbate a TBI and result in secondary brain injury. Assessment and management of the head-injured child is discussed in a separate article in this issue of the journal. The vast majority of serious chest injuries in children are the result of blunt trauma. Most are the result of car and bicycle crashes. The presence of significant chest injury enhances the potential for multisystem trauma mortality by a factor of 10. Life-threatening thoracic injuries, such as airway obstruction, tension pneumothorax, massive hemothorax, and cardiac tamponade, are identified and treated during the primary survey. The compliance of the child's rib cage allows significant injury to occur with few obvious external signs of trauma. Energy is transmitted to the thoracic contents, and pulmonary contusions and hematomas are relatively more common, noted in more than 60% of children with severe thoracic injury. Because children have high oxygen consumption and low functional residual capacity, pulmonary contusions can result in severe hypoxemia, which may be refractory to oxygen therapy. Commotio cordis is a disorder described in the pediatric population that results from a sudden impact to the anterior chest wall (such as a baseball injury) that causes cessation of normal cardiac function. , The child may have an immediate dysrhythmia or ventricular fibrillation that is refractory to resuscitation efforts. The physical examination of the child's abdomen begins during the secondary survey. The stomach and bladder need to be decompressed, and abrasions and contusions of the torso need to be looked for. Persistent, gentle palpation of the abdomen may find significant tenderness if the level of consciousness is not impaired and there are no distracting injuries. Computed tomography (CT) remains the gold standard for diagnosing abdominal injuries. Although CT detects most abdominal injuries, only 5% of patients with abnormal findings on CT go to surgery for treatment of these injuries. The success rate of non-operative management is high (95%) in children with solid organ injuries. These patients are managed with serial abdominal examinations and hematocrits, bed rest, and may need repeated imaging studies such as CT scans or ultrasounds. It is prudent to type and crossmatch blood products for all trauma patients with blunt solid organ injuries, as sudden, unexpected deterioration due to internal hemorrhage is a possibility. Diagnostic peritoneal lavage (DPL) can rapidly determine or exclude the presence of intraperitoneal hemorrhage. This diagnostic tool is used less often with the increasing use of FAST and abdominal CT scan in many trauma centers. DPL is most useful in patients who are hemodynamically unstable, those with an unreliable physical examination, especially when CT or ultrasonography detects minimal fluid or when the patient manifests fever, peritonitis, or falling hematocrit that cannot be otherwise explained. DPL can also be used to evaluate abdominal trauma in children who require urgent surgical intervention for associated extra-abdominal injuries, such as craniotomy. A negative result on DPL lets the clinician proceed with management of other injuries and avoids unnecessary laparotomy for the patient. If the airway is obstructed, inspect the mouth for a foreign body and remove it, but do not perform a blind finger sweep, which may push it further into the airway. Suction to clear blood, secretions, or vomitus. Perform an airway-opening maneuver: jaw thrust or chin lift. If there is any possibility of C-spine injury, do not perform a head tilt maneuver. If the child is unconscious, an oral airway may be required to lift the soft palate away from the base of the tongue. Bear in mind that inserting an oral airway into a semi-conscious child's mouth may cause gagging and vomiting. Administer high-flow oxygen via a non-rebreathing face mask with an oxygen reservoir. If an airway device has been placed prior to arrival in the trauma bay, the emergency department (ED) physician and/or anesthesiologist should not assume that it is the appropriate device, or that it has been correctly placed. The receiving team needs to be familiar with airway devices used by pre-hospital personnel, as they may differ from those used in the hospital. Capnography is the gold standard to confirm ventilation of the lungs. Capnography does not rule out mainstem bronchial intubation, however. Also, an ETT which is dislodged just proximal to the vocal cords could result in a waveform on the capnograph. If intubation is necessary, a quick assessment of the airway should be made prior to induction of anesthesia and administration of a neuromuscular blocking drug. A back-up plan should be in place in anticipation of a difficult or failed intubation. A gum elastic bougie of appropriate size should be immediately available. A video laryngoscope, fiberoptic scope or LMA Fastrach TM should also be kept handy. Presume that the child's C-spine is injured until proven otherwise, especially in a child with a head injury. Techniques of immobilizing the C-spine include towel rolls, cervical collar, spinal board, and tape. Manual inline stabilization (MILS) of the C-spine is essential for intubation. For non-intubated patients arriving to the emergency room (ER), it is vital to assess, re-assess, and keep re-assessing ABCs for adequacy until the patient is transferred to the definitive care place (ICU or floor or the operating room). Pediatric victims of polytrauma have near-normal vital signs even in the presence of significant blood loss, and can deteriorate rapidly. These children should be monitored with extra vigilance during transport to the CT scanner, in the CT scanner, and in the emergency room. Patients who arrive to the ER intubated should be monitored for existing or developing complications such as barotrauma or endobronchial intubation, in addition to ensuring that their oxygenation and ventilation is adequate. If the child has confirmed or suspected head injury, and if ICP is monitored, mild hyperventilation may be needed for refractory increases in ICP. Prophylactic hyperventilation is not recommended, and may be harmful, by causing cerebral vasoconstriction and ischemia. Another reason for withholding or under-dosing opioids is fear of side effects such as respiratory depression, hypotension, nausea and vomiting, and drowsiness. These side effects can be reduced or avoided by employing regional anesthesia techniques. Epidurals, paravertebral blocks, ,, or even simple intercostal nerve blocks  can be extremely useful for children with rib fractures or flail chest. Femoral nerve block or fascia iliaca block can easily be performed in the ED to relieve pain from femoral fracture rapidly and effectively. While femoral nerve block is common in some countries (Australia  and UK  ), it is uncommon in the emergency setting in North America. If a regional anesthetic technique is not possible, a multimodal analgesic technique combining acetaminophen and NSAIDs reduces the dose of opioids required to treat pain. In the child who is NPO, IV acetaminophen and IV ketorolac can be given. IV patient-controlled analgesia (PCA) can be used in children above the age of about 5 years, and it allows the child to titrate opioid boluses according to the pain that they are experiencing. All victims of major trauma should be considered to be at risk for hypothermia. Children are more prone to develop hypothermia than adults. Hypothermia can lead to arrhythmias, coagulation abnormalities, and acidosis. The latter two, along with hypothermia, constitute "the triad of death" in trauma patients. An initial core temperature measurement (oral, rectal, or bladder) should be done as a part of the primary survey. The pediatric trauma room in the ED should be maintained at >80° F. Passive rewarming, i.e. removal of wet clothing/linen and coverage with warm blankets, along with minimizing exposure for diagnostic procedures, should be undertaken in all children. The child's head should be covered with a reflective hat. All IV fluids and blood products should be warmed using fluid warmers. Active external rewarming with a convective air blanket (e.g. Bair Hugger® ) should be considered in all children with a core temperature of <36°C. Experiences with accidents, injuries, physical abuse, or hospitalization can leave a lasting impact on some children's minds. While some are able to cope with the experience and move on, some others and their families may benefit from psychosocial support and intervention. Medical facilities dealing with traumatized children should have a multidisciplinary team, comprised of social workers, psychiatrists, psychologists, etc., to help patients and their families deal with the after-effects of a traumatic experience. 1. Stafford PW, Blinman TA, Nance ML. Practical points in evaluation and resuscitation of the injured child. Surg Clin North Am 2002;82:273-301. 2. Avarello JT, Cantor RM. Pediatric major trauma: An approach to evaluation and management. Emerg Med Clin North Am 2007;25:803-36. 3. Schafer I, Barkmann C, Riedesser P, Schulte-Markwort M. Posttraumatic syndromes in children and adolescents after road traffic accidents- -A prospective cohort study. Psychopathology 2006;39:159-64. 4. Osler TM, Vane DW, Tepas JJ, Rogers FB, Shackford SR, Badger GJ. Do pediatric trauma centers have better survival rates than adult trauma centers? An examination of the national pediatric trauma registry. J Trauma 2001;50:96-101. 5. Potoka DA, Schall LC, Gardner MJ, Stafford PW, Peitzman AB, Ford HR. Impact of pediatric trauma centers on mortality in a statewide system. J Trauma 2000;49:237-45. 6. Oyetunji TA, Haider AH, Downing SR, Bolorunduro OB, Efron DT, Haut ER, et al. Treatment outcomes of injured children at adult level 1 trauma centers: Are there benefits from added specialized care? Am J Surg 2011;201:445-9. 7. Kleinman ME, Chameides L, Schexnayder SM, Samson RA, Hazinski MF, Atkins DL, et al. Part 14: pediatric advanced life support: 2010 American heart association guidelines for cardiopulmonary resuscitation and emergency cardiovascular care. Circulation 2010;122(18 Suppl 3):S876-908. 8. Donoghue AJ, Nadkarni V, Berg RA, Osmond MH, Wells G, Nesbitt L, et al. Out-of-hospital pediatric cardiac arrest: An epidemiologic review and assessment of current knowledge. Ann Emerg Med 2005;46:512-22. 9. Crewdson K, Lockey D, Davies G. Outcome from paediatric cardiac arrest associated with trauma. Resuscitation 2007;75:29-34. 10. Murphy JT, Jaiswal K, Sabella J, Vinson L, Megison S, Maxson RT. Prehospital cardiopulmonary resuscitation in the pediatric trauma patient. J Pediatr Surg 2010;45:1413-9. 11. Pang D. Spinal cord injury without radiographic abnormality in children, 2 decades later. Neurosurgery 2004;55:1325-42; discussion 42-3. 12. Hoffman JR, Mower WR, Wolfson AB, Todd KH, Zucker MI. Validity of a set of clinical criteria to rule out injury to the cervical spine in patients with blunt trauma. national emergency X-Radiography utilization study group. N Engl J Med 2000;343:94-9. 13. Viccellio P, Simon H, Pressman BD, Shah MN, Mower WR, Hoffman JR: NEXUS Group. A prospective multicenter study of cervical spine injury in children. Pediatrics 2001;108:E20. 14. Kanz KG, Paul AO, Lefering R, Kay MV, Kreimeier U, Linsenmaier U, et al. : Trauma Registry of the German Trauma Society. Trauma management incorporating focused assessment with computed tomography in trauma (FACTT) - potential effect on survival. J Trauma Manag Outcomes 2010;4:4. 15. Wurmb TE, Fruhwald P, Hopfner W, Keil T, Kredel M, Brederlau J, et al. Whole-body multislice computed tomography as the first line diagnostic tool in patients with multiple injuries: The focus on time. J Trauma 2009;66:658-65. 16. Frush DP, Donnelly LF, Rosen NS. Computed tomography and radiation risks: What pediatric health care providers should know. Pediatrics 2003;112:951-7. 17. Brunetti MA, Mahesh M, Nabaweesi R, Locke P, Ziegfeld S, Brown R. Diagnostic radiation exposure in pediatric trauma patients. J Trauma 2011;70:E24-8. 18. Scaife ER, Rollins MD. Managing radiation risk in the evaluation of the pediatric trauma patient. Semin Pediatr Surg 2010;19:252-6. 19. Boffard KD, Goosen J, Plani F, Degiannis E, Potgieter H. The use of low dosage X-ray (Lodox/Statscan) in major trauma: Comparison between low dose X-ray and conventional x-ray techniques. J Trauma 2006;60:1175-81; discussion 81-3. 20. Deyle S, Wagner A, Benneker LM, Jeger V, Eggli S, Bonel HM, et al. Could full-body digital X-ray (LODOX-Statscan) screening in trauma challenge conventional radiography? J Trauma 2009;66:418-22. 21. Smyth BT. Chest trauma in children. J Pediatr Surg 1979;14:41-7. 22. Maron BJ, Poliac LC, Kaplan JA, Mueller FO. Blunt impact to the chest leading to sudden death from cardiac arrest during sports activities. N Engl J Med 1995;333:337-42. 23. Abrunzo TJ. Commotio cordis. The single, most common cause of traumatic death in youth baseball. Am J Dis Child 1991;145:1279-82. 24. Nadler EP, Potoka DA, Shultz BL, Morrison KE, Ford HR, Gaines BA. The high morbidity associated with handlebar injuries in children. J Trauma 2005;58:1171-4. 25. Scaife ER, Fenton SJ, Hansen KW, Metzger RR. Use of focused abdominal sonography for trauma at pediatric and adult trauma centers: A survey. J Pediatr Surg 2009;44:1746-9. 26. Holmes JF, Gladman A, Chang CH. Performance of abdominal ultrasonography in pediatric blunt trauma patients: A meta-analysis. J Pediatr Surg 2007;42:1588-94. 27. Fenton SJ, Hansen KW, Meyers RL, Vargo DJ, White KS, Firth SD, et al. CT scan and the pediatric trauma patient--are we overdoing it? J Pediatr Surg 2004;39:1877-81. 28. Holmes JH 4th, Wiebe DJ, Tataria M, Mattix KD, Mooney DP, Scaife ER, et al. The failure of nonoperative management in pediatric solid organ injury: A multi-institutional experience. J Trauma 2005;59:1309-13. 29. von Baeyer CL, Spagrud LJ. Systematic review of observational (behavioral) measures of pain for children and adolescents aged 3 to 18 years. Pain 2007;127:140-50. 30. Stewart B, Lancaster G, Lawson J, Williams K, Daly J. Validation of the alder hey triage pain score. Arch Dis Child 2004;89:625-30. 31. Merkel SI, Voepel-Lewis T, Shayevitz JR, Malviya S. The FLACC: A behavioral scale for scoring postoperative pain in young children. Pediatr Nurs 1997;23:293-7. 32. Garra G, Singer AJ, Taira BR, Chohan J, Cardoz H, Chisena E, et al. 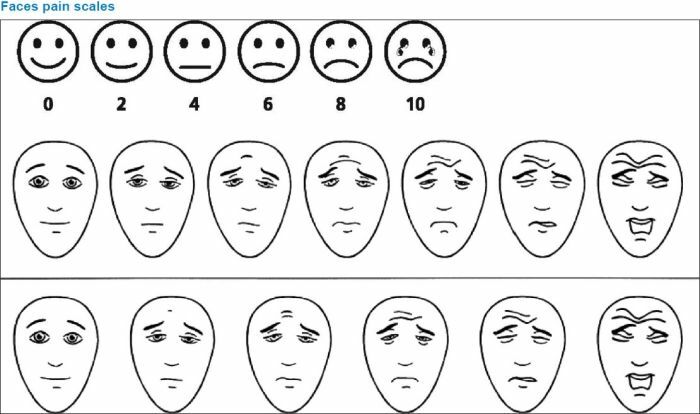 Validation of the wong-baker FACES pain rating scale in pediatric emergency department patients. Acad Emerg Med 2010;17:50-4. 33. von Baeyer CL, Spagrud LJ, McCormick JC, Choo E, Neville K, Connelly MA. Three new datasets supporting use of the Numerical Rating Scale (NRS-11) for children's self-reports of pain intensity. Pain 2009;143:223-7. 34. Gausche M, Lewis RJ, Stratton SJ, Haynes BE, Gunter CS, Goodrich SM, et al. Effect of out-of-hospital pediatric endotracheal intubation on survival and neurological outcome: A controlled clinical trial. JAMA 2000;283:783-90. 35. Todd KH, Ducharme J, Choiniere M, Crandall CS, Fosnocht DE, Homel P, et al. Pain in the emergency department: Results of the pain and emergency medicine initiative (PEMI) multicenter study. J pain 2007;8:460-6. 36. Alexander J, Manno M. Underuse of analgesia in very young pediatric patients with isolated painful injuries. Ann Emerg Med 2003;41:617-22. 37. Ranji SR, Goldman LE, Simel DL, Shojania KG. Do opiates affect the clinical evaluation of patients with acute abdominal pain? JAMA 2006;296:1764-74. 38. Lonnqvist PA. Continuous paravertebral block in children. Initial experience. Anaesthesia 1992;47:607-9. 39. Lonnqvist PA, Olsson GL. Paravertebral vs epidural block in children. Effects on postoperative morphine requirement after renal surgery. Acta Anaesthesiol Scand 1994;38:346-9. 40. Richardson J, Lonnqvist PA, Naja Z. Bilateral thoracic paravertebral block: potential and practice. Br J Anaesth 2011;106:164-71. 41. Matsota P, Livanios S, Marinopoulou E. Intercostal nerve block with Bupivacaine for post-thoracotomy pain relief in children. Eur J Pediatr Surg 2001;11:219-22. 42. Chu RS, Browne GJ, Cheng NG, Lam LT. Femoral nerve block for femoral shaft fractures in a paediatric emergency department: Can it be done better? Eur J Emerg Med 2003;10:258-63. 43. Pennington N, Gadd RJ, Green N, Loughenbury PR. A national survey of acute hospitals in England on their current practice in the use of femoral nerve blocks when splinting femoral fractures. Injury 2012;43:843-5.